In case you missed it yesterday, the White House released a new album of Flickr photos of the last year in health reform that has been burning up the internet. My Twitter feed today has been filled with people ooh-ing and aah-ing over the photos. 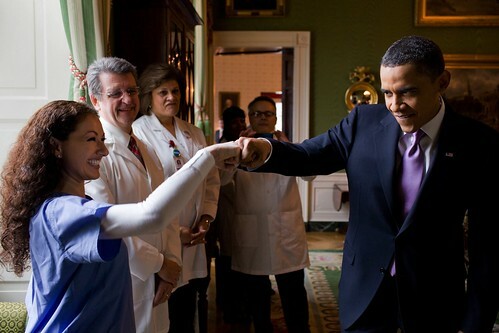 White House photographer Pete Souza captures a glimpse of behind-closed-doors moments at the White House from this past week and the past year as the White House worked to pass the health care bill — and they are, well, heartwarming. 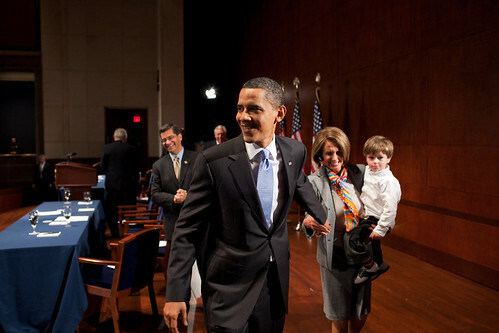 We see Hillary Clinton hugging President Obama; White House staffers cheering, applauding, and hugging as they watched Congress vote on the bill late Sunday night; Obama fist-bumping a young doctor who grins ear-to-ear; Nancy Pelosi holding her grandson and grinning next to Obama a day before the historic House vote. Flickr is not a new tool; people have been using it to share their important moments with friends and family for years. But the Obama White House is the first White House to use Flickr to share their photos and are publicly documenting private moments that, until now, had remained hidden from the American people. Last week, progressive activists Tracy Viselli, Jim Gilliam, Gina Cooper, and Jon Pincus launched TweetProgress.us, a directory of progressives on Twitter with the goal of helping progressives better organize online. Also last week, Republicans launched a new Republicans-only social networking site, Republicanville, with the goal of helping Republicans better connect and organize online. Which tool will achieve its stated goals of helping its community better organize themselves online, connect with each other, and use Twitter for activism and organizing? Obviously I’m biased in which one I want to see succeed. TweetProgress already has had 3,000 Twitter users sign up, including Al Gore, Rachel Maddow, and Ohio Secretary of State Jennifer Brunner, among others. Conservatives on Twitter have long been organizing through use of the #tcot hashtag, which even progressives admit has given conservatives the upper hand when it comes to organizing via Twitter. Republicanville, on the other hand, claims to be a social network “of the people, by the people, and for the people.” Founded by Republicans Stryker Lampe and Charles A. Jense, the website states that their “fundamentals are based on fiscal conservatism with the ideals of smaller government, low taxes, stronger defense and capitalism. We welcome all types of Republicans + Independents & Libertarians.” It seems similar to Facebook — albums, profiles, groups, blogs, and in addition: a Republican job board. I haven’t seen enough coverage of it yet to find out more about what their goals are, or how many people have joined since their launch. It also begs the question: does the internet really need another social networking site? I will definitely be paying attention to see how these two new tools fare over the next few weeks and how they will affect both sides’ ability to organize online. Wait, what? You mean there is a use for LinkedIn? Yes there is, and the White House has found it! According to the LinkedIn blog, the White House has been using the “Questions” feature on LinkedIn to ask small business owners what they think about healthcare reform. Check out the full post at the LinkedIn blog here. And even better, check out Romer’s video answering the questions she received on LinkedIn here. Last week the internets saw the launch of yet another new social networking site, but this one with a twist: it’s just for Congress. Great, you think, so now members of Congress have their own private place to write on walls and poke each other and write passive-aggressive status updates! But 3121, named for the phone extension of the Capitol switchboard, focuses on creating a dynamic directory of the tens of thousands of staffers that work on Capitol Hill — and at home in District offices. I should probably disclose that 3121 is a project of the company I work for, in conjunction with the National Journal group. But this is exactly the kind of innovation going on at the intersection of politics and new media that will change the way our government operates. 3121 is a dynamic directory: this means that in addition to having the information that we can provide you at National Journal, community members are able to update their own profiles. This makes users constantly accessible, so you’ll know who moved from HELP to Foreign Relations right when it happens. 3121 is also a tool for collaboration: through our recommendation engine and with flexible, easy to navigate group pages, 3121 acts as a tool to help people better connect with relevant staffers to get their job done. 3121 puts you in control and allows for a customizable dashboard and customized news. The more you get to know the system and the more we get to know you, the more 3121 will rearrange and deliver you what you need, when and where you need it. From news on your issue and Member, to positioning your own profile and collaboration tools front and center, we give you what you need to make it your own. By combining a social network + Hill directory + news aggregator, 3121 can solve two problems that Hill staffers and Washington insiders are constantly dealing with: too much email and too much news. Can 3121 reduce this information overload and…perhaps…make Congress more efficient? 🙂 We’ll have to see. 3121 is in private beta right now, but will fully launch in September, and I’m excited to see it grow.